While I look forward to summertime and love my garden, I’ll confess to enjoying a bit of air conditioning and an indoor breeze under a ceiling fan after playing in the dirt under the hot sun. I’ll also confess to feeling hungry after working in the garden, and unfortunately there’s nothing to harvest from the garden just yet! Today I sated my post-gardening sweet tooth with this easy recipe for Rum Caramel Corn. I used a banged up old pot to cook the caramel. Boiling caramel may (or may not) cause a harmless, slight discoloration inside of a pan. To clean the pan in which you boiled the caramel, here’s an easy tip: fill the pan about 2 inches deep with water, and bring the water to a boil on the stove. When the water is boiling, add about 2 tablespoons of baking soda to the pan. Immediately cover the pan and remove from heat. After about 15 minutes, when the water is still warm but comfortable to touch, scrub the inside of the pan. Voila! The caramel residue will wash away. 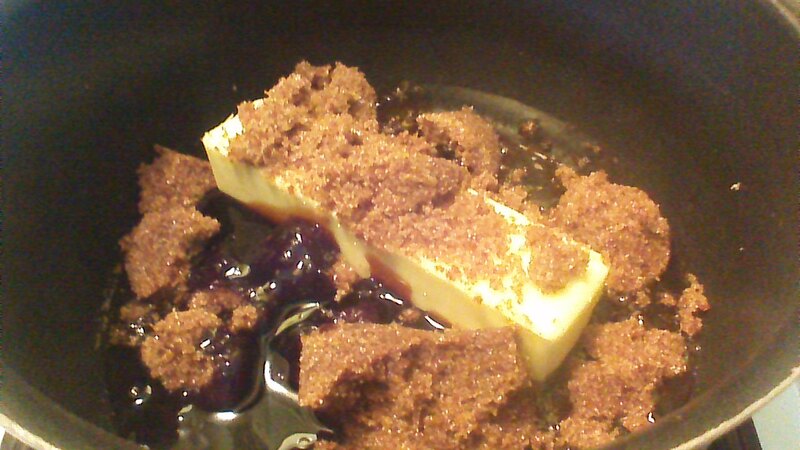 Step 1) Combine butter, brown sugar, light corn syrup, and molasses in an old saucepan. Bring to a boil over medium heat, stirring constantly. 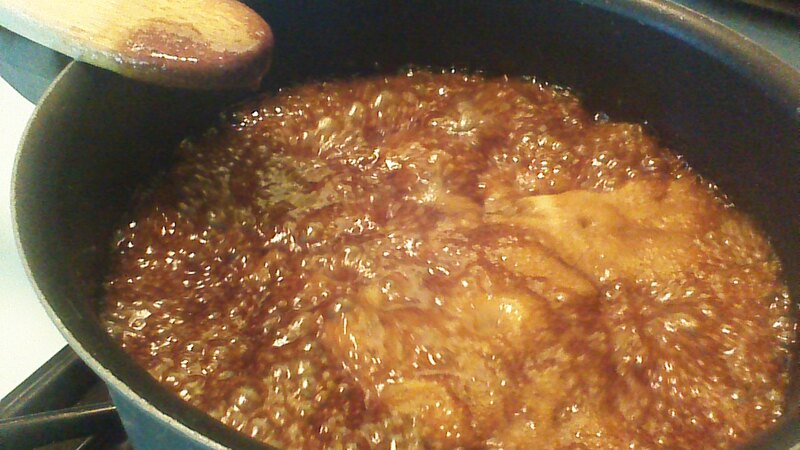 Step 2) Allow caramel mixture to boil gently for 7 minutes, stirring frequently. Remove from heat. Stir in rum flavoring. Step 3) Spread popcorn on baking sheets lined with waxed paper. 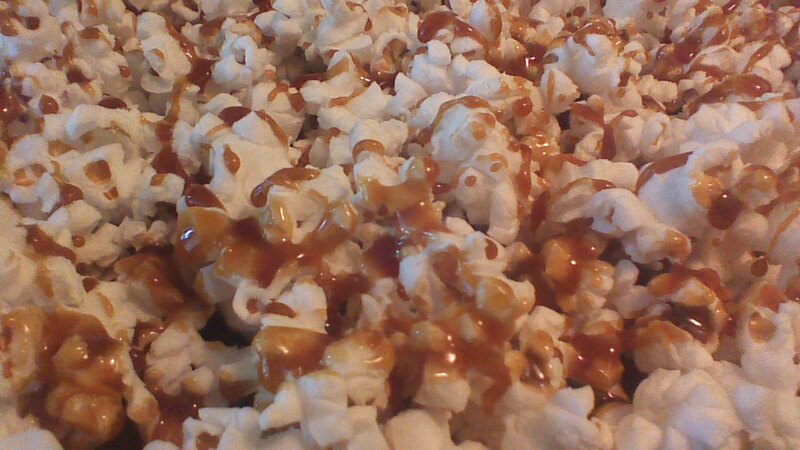 Carefully drizzle the caramel mixture over the popcorn. Use a metal spatula to gently lift the coated popcorn. 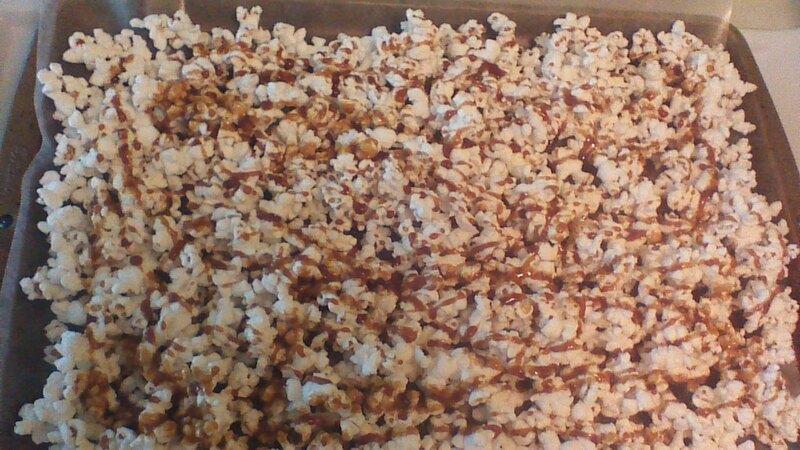 This spreads the caramel onto more of the popcorn, and also helps to prevent sticking. This entry was posted in Gluten Free, Lunchbox Treats, Uncategorized and tagged baking, children, Cooking, Family, Food, fun, Gluten Free, kids, Kitchen, movies, popcorn, Snacks, Vegetarian. Bookmark the permalink. Growing up we got home made “Carmel” by boiling/simmering a submerged sealed can of sweetened condensed milk for two hours. Later in life I found a faster (and safer) method by pouring the sweetened condensed milk into a double boiler for an hour. There is a similar method of carmelizing sweetened condensed milk using the oven. I’ve heard of the boiled can method, but never tried it because it sounded incredibly dangerous! Using a double boiler sounds intriguing – I’ll give it a try!